The WaveJudge 5000 also provides the scalability to expand the solution in terms of ports or memory as your needs change. For large-scale testing, up to 64 chassis can be daisy-chained to house up to 256 modules. 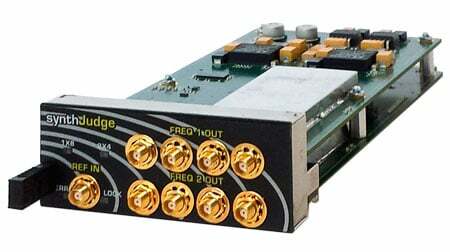 All ports in a WaveJudge 5000 system are truly synchronized and are sample- and phased-locked (coherent). By providing synchronized, coherent ports right out of the box, the WaveJudge 5000 does not rely on independent synchronization lock per test device that can drift with respect to a common source. This saves you the time required up front to assure all devices are synchronized, or in the case of some multibox solutions, calibrated. You also save the time lost in troubleshooting synchronization and coherence issues during testing. The latest in DSP cores, FPGA density, dynamic RAM and technology-specific accelerators power the IntelliJudge2 modules and provide real-time testing. Cost-effectively analyze, trigger, filter, log, and chart everything in the wireless channel for any amount of time. Because the IntelliJudge2 modules are now completely integrated into the WaveJudge 5000 platform, you can configure your system to take advantage of real-time analysis with no time constraints, triggering on lower and upper layer events, errors, messages, and message content. This gives you the powerful ability to isolate problem areas regardless of the layer in which they occur, to detect and eliminate transient errors and bypass the finger pointing between vendors that can delay release dates by weeks or months. Read more about the IntelliJudge. Dual-frequency, from 380 MHz to 6 GHz, is particularly useful when developing systems for multiple markets. Leverage your testing investment to cover multiple spectrum bands. Some test solutions require multiple boxes, which must synchronize to a common external clock (typically 10 MHz) received via cables for sampling. Sample count alignment is typically handled by either field calibration or GPS timestamp correlation between boxes. In the WaveJudge 5000, there is only one master clock module, which is derived from a selection of internal OCXO, external user clock, or GPS. This sample clock, along with the exact sample count, is distributed to all chassis and modules in a WaveJudge 5000 system. There is never a need to worry about sample count or timestamp misalignment. You can customize your system for analysis/troubleshooting of short captures or for tracking long-term trends or to isolate intermittent anomalies. In addition, down-converted analog IQ signals are now stored on the memory modules instead of a fixed 4 GB cache, allowing you to extend the capture time-frame for enhanced troubleshooting. Depending on your application, IQ captures can be invaluable in recreating the wireless channel and providing in-depth physical analysis. The IntelliJudge2 modules share dynamic RAM for short captures of seconds or minutes depending on your module arrangement, while StoraJudge SSD modules store hours of IQ capture. This flexibility addresses your application requirements without breaking your budget. 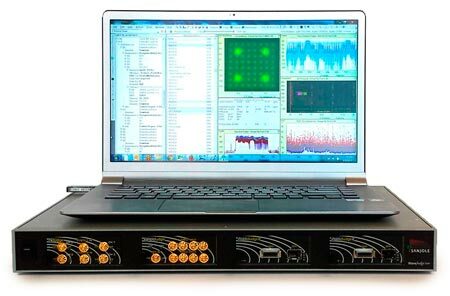 The WaveJudge 5000 is controlled by a laptop or desktop PC running WaveJudge 5000 software connected to the test network via an Ethernet port. The user-friendly software control package, with its strong visual emphasis, greatly simplifies test set up and provides quick graphic confirmation of the test configuration. This feature is very valuable when dealing with complex scenarios.